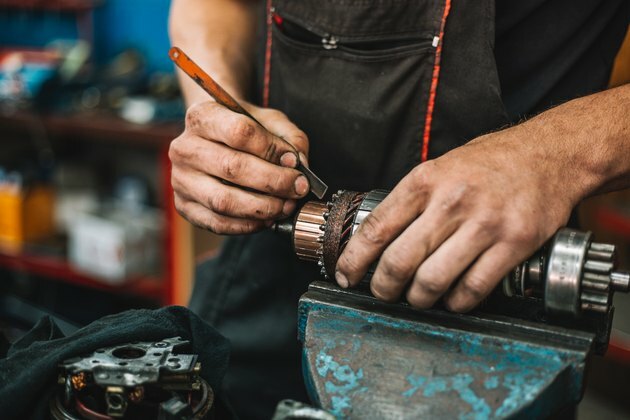 If you'll be doing work with motors at home or at your place of business, it's helpful to know a bit about how they work. In some instances, you might find a need to reverse the direction of a single-phase AC motor. Fortunately, this is a fairly simple task because most single-phase induction motors go in forward and reverse depending on their wiring and the resulting magnetic field. Before undertaking this sort of project, however, certain safety procedures must be adhered to as with any electrical work. It's essential that you fully comprehend all of the required steps to an electrical project before you begin. For your safety, you should always inform others present that you will be working with electricity and ask that they not flip any breakers or switches until you are finished. Turn off all power to the motors you'll be using at the circuit breaker box. Whenever possible, wear high-voltage rubber gloves and use rubber-handled tools. At the core of an induction motor is a rotor. This rotor is comprised of permeable iron and an aluminum circuit winding. This aluminum winding causes the motor to resist rapid magnetic field changes. This means that whatever field the motor senses is the one it will follow. Because of this, it's possible to reverse the direction of the motor by reversing the field that it follows. To reverse rotation on a single phase capacitor start motor, you will need to reverse the polarity of the starter winding. This will cause the magnetic field to change directions, and the motor will follow. In order to achieve this, you can swap the connections on either end of the winding. Always reverse the wires that lead to the starter winding. Note that most motors, if still labeled with manufacturer instructions, will indicate that they are non-reversible. If this is the case, it's likely because the wires you would need to access are housed within the motor. If your unit has this warning, it's easiest not to proceed. If, however, your motor is reversible, you might notice that it provides instructions for reversal. Usually, these instructions will tell you which wires to change. For instance, some units might have you switch the red and green leads in the terminal box at the end of the casing. In other instances, the blue and yellow wires may need to be swapped. The color of the wires is highly individual and depends upon the brand and model of motor you have. It's best to read the instructions provided by the manufacturer before proceeding. If you have determined which wires can be reversed, use a flathead screwdriver to remove the motor's end caps. Your motor may have a junction box instead. In either case, you'll need to gain access to the terminals where the indicated wires are attached. You may be able to use needle-nosed pliers to remove the wires and switch the terminals to which they attach. Some systems use nuts to connect the wires. If that's the case for you, you'll need to use a nut driver to gain access to the terminals. Once you've finished switching the wires, replace the end cap or close the junction box to the motor. Restore power to the circuit and test the motor to ensure the magnetic field has switched and that it is indeed now spinning in the opposite direction.